World War II was ending, and Rudolph Loebel’s father had been killed at the Nazi concentration camp at Auschwitz, in German-occupied Poland. Fearing for his safety, Loebel's mother sent her teenage son to a children’s home in a small town in the mountains of central Switzerland. There, he met another teenager named Rachel, who also had fled the war in Germany. When Rudolph first arrived at the children's home, Rachel thought he looked sad and wanted to cheer him up. 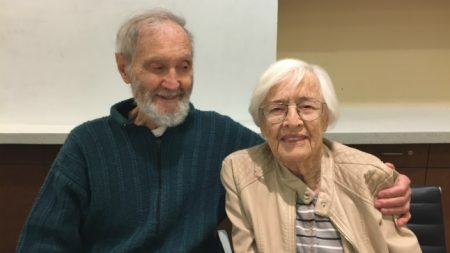 From that act of kindness a relationship sprung that has spanned more than seven decades and all of life’s ups and downs. Rudolph and Rachel later married in Israel, and then moved to the United States to join his sisters, eventually settling in Los Angeles, their current home. “She always found a way to keep us together in tough times,” says Rudolph, a retired child psychologist. “He has always been so nice and patient,” says Rachel, who was a stay-at-home mother to their three children. One of those ups and downs came in 2016, when their cardiologist delivered some difficult news. Rudolph was diagnosed with aortic stenosis, a condition in which the heart valve becomes hardened with calcium deposits and can’t open wide enough to adequately pump blood through the body. The condition can put more strain on the heart and put the patient at increased risk of chest pain, congestive heart failure, irregular heart rhythms and cardiac arrest. Without a procedure to address his heart valve problem, Rudolph recalls, his doctor said he was unlikely to live another year. And then Rachel was diagnosed with the same condition at roughly the same time. At 90 years old, open-heart surgery was too risk for them both. Their doctor offered an option developed for high-risk patients like them. It was a non-surgical procedure to implant a new replacement valve through a small incision through the groin or the chest. The procedure is called transcatheter aortic valve replacement, or TAVR. UCLA was among the nation’s first centers to begin offering TAVR in 2012 after it was approved by the U.S. Food and Drug Administration in Nov. 2011. The average age of patients is in their 80’s, although the FDA recently expanded the use of TAVR surgery to younger patients who are at elevated risk for open heart valve replacement surgery. In Rudolph’s case, he felt chest pain when walking fast. Rachel led a more sedentary lifestyle and did not have noticeable symptoms but complained of fatigue. 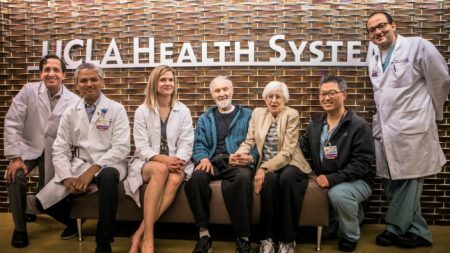 Rudolph and Rachel Loebel (center) pose in February 2018 with members of the UCLA heart team that helped perform their TAVR procedures in 2016. After they both learned of the need for TAVR surgery, the UCLA heart team and the Loebels decided that Rudolph would schedule his procedure for July 2016. The plan was to allow him time to recover so he could take care of Rachel after she had the surgery. Rudolph's procedure was done under conscious sedation, a type of anesthesia in which the patient remains awake but is sleepy and pain-free. UCLA is one of the few hospitals that offers it and published findings on its benefits in the journal PLOS ONE in April 2017. Rachel then had her procedure a month later. Since doctors were not able to access the artery through her groin, they performed the procedure through a small opening in her chest. Both did well and made full recoveries. Now that their heart valves are repaired, the Loebels feel much better. They stay active by walking, and Rudolph also enjoys riding the stationary bike.